This summer, a number of new culinary and cocktail delights await guests of Fairmont Hotels & Resorts, Swissôtel Hotels & Resorts and Raffles Hotels & Resorts, the world-leading brands within the FRHI family of hotels. Food flair is being served with a nod to current trends, with hotels globally offering playful ways to enjoy old favorites, from ice cream to éclairs, while keeping it "grown up cool" with new cocktail culture experiences and tasty twists on traditional dishes. Internationally, the hotel company has a long list of hotels known for providing unforgettable dining experiences that reflect and celebrate each destination and its unique local flavors. Keeping ahead of food and beverage trends and anticipating the emerging tastes of travelers has also always been paramount. Inspired by pop culture programming and social media, it's clear that more people are seeking authentic experiences, particularly as it relates to innovative food and beverage offerings. Culinary tourism is considered one of the fastest growing specialty travel trends, with a recent "American Culinary Traveler Report" published by Mandala Research claiming that the percentage of U.S. leisure travelers seeking unique dining experiences grew from 40% to 51% between 2006 and 2013. The World Food Travel Association estimates that it's currently a $150 billion USD niche industry. As travelers become savvier and more discriminating in their food adventures, FRHI's luxury brands continue to create and cater bold, fun, and delicious offerings that make an impact on guests. With the launch of Melba, the recently opened gourmet take-away counter at London's The Savoy, executive pastry chef Ludwig Hely has created an instant classic with the hotel's new signature item; éclairs. Inspired by his French roots and childhood memories, he's crafted a luxury indulgence that is versatile enough to be served with coffee but also beautiful enough to be presented as a decadent gift box selection. The éclairs at this iconic Fairmont hotel are painstakingly hand-crafted, with artistic, enchanting results. Flavors change seasonally and include passion fruit and milk chocolate, lychee, rose and raspberry, lemon meringue, salted caramel, lavender, and Melba, each priced at £2.95. Located directly on the Strand, the elegant new outlet, named for one of the hotel's most famous early residents, Dame Nellie Melba, also offers a selection of pastries, sandwiches, and hot and cold beverages to take away, as well as gift items. This summer, Le Royal Monceau - Raffles Paris offers a sweet new secret hideaway. Pastry chef Pierre Hermès, world-renowned for his macaroons and pastries, is bringing his passion for innovative flavors to the world of frozen delights. Bar Glacier by Pierre Hermès is found on the hotel's terrace, the ideal spot to sample a scoop and then stroll the Parc Monceau. The resident ice cream maker will prepare cones right on the spot, with fresh, inspired options including Infiniment Chocolat, Infiniment Vanille, Infiniment Café, Infiniment Caramel, Passion Fruit, Vanilla with Violet, Pistachio, Strawberries, and Ispahan (rose/lychee). The delectable treats are available daily from noon to 6 p.m. with single scoops for 7EUR and doubles for 12EUR. Fairmont Waterfront's executive chef Dana Hauser is taking her plant-to-plate inspired frozen treats on the road… literally. 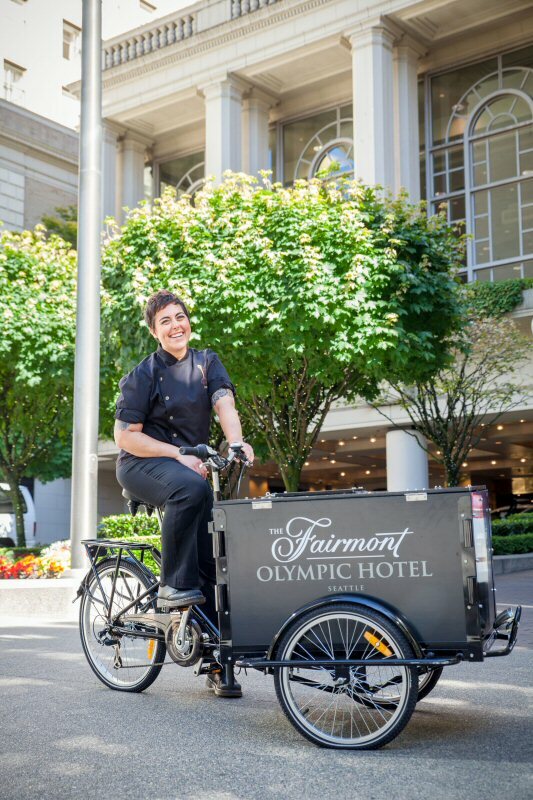 The Vancouver hotel's Icicle Tricycle serves up Waterfront Honey Lemonade & Rooftop Mint and Strawberry & Rhubarb popsicles, both using herbs and berries from the hotel's rooftop garden. Also on offer are decadent house-made, hand-churned ice creams including Chambord Blackberry Ripple, Stracciatella and Burnt Rooftop Honey, made with a generous dollop of golden sweetness straight from the hotel's 250,000 honeybees. When not perched poolside or in front of the hotel's signature restaurant, ARC, the Icicle Tricycle can be seen making the rounds of the city's summer food festivals like Feast of Fields and Hastings Urban Farm. Nearby sister hotel in Seattle, Fairmont Olympic Hotel also follows the "have bike, will travel" motto, using its Icicle Tricycle to deliver single-serving push pops, filled with house-made ice creams like Bee Products, using bee pollen, lavender and honey from the rooftop apiary; or the Rodger Rabbit, cream cheese ice cream with chunks of carrot cake, to guests at weddings or promotional and catering events. One of the world's most glamorous destinations is getting even more luxe this summer, with the arrival of a Nikki Beach pop-up on the rooftop of Fairmont Monte Carlo. With its stunning panoramic views of the Mediterranean Sea, the resort-like hotel provides a picture-perfect backdrop for the luxury lifestyle brand's beach club concept, which combines elements of entertainment, dining, music, fashion, film and art into one stylish oasis. Nikki Beach at Fairmont Monte Carlo is adorned in plush, all-white sun beds, reflecting the same opulent yet contemporary look and feel of its other trendsetting locations worldwide. Guests can spend days and evenings poolside, indulging in refreshing cocktails, endless champagne and an extensive menu of delectable dishes or attend one of the many planned signature events or themed days. Vancouver's Fairmont Pacific Rim offers another hip haven. The rooftop pool is a tropical, resort-like respite in the heart of the city, with two pavilions and three private cabanas, flanked by palm trees, creating an exclusive, VIP experience. The seasonal full-service cabana bar serves up summer sips and snacks, such as the signature Cabana Mule, and a custom-made ice cream stand offering house-made freezies to keep things extra cool. Lounge 6 on the sixth floor terrace of Raffles Istanbul attracts dynamic trendsetters not only for its dramatic panoramic cityscape, but also for its classic cocktails with a cheeky local twist. The intoxicating mix of bourbon, cognac, pomegranate and lime juice, honey nectar and vanilla syrup with a blackberry garnish transforms the stately Sour into the irresistible Sultan's Seal, a sign of official approval. The lounge's signature cocktail, the Basil-ica Mule is named for the Cistern Basilica, one of the city's most striking Byzantium structures. Inspired by the classic Moscow Mule cocktail, it adds Istanbul panache by substituting vodka with cranberry vodka and rum, adding homemade ginger and hibiscus beer, and topping it with a leaf of basil. Celebrating with friends makes everything twice as nice, and the hotel is on trend with "shared cocktails", generous pitchers of favorites like Mojitos and Sangria, and shared plates from its signature restaurant, Arola. Guests of Swissôtel Büyük Efes, Izmir in Turkey don't even need to leave the comfort of their rooms if they fancy a refreshing cocktail. The hotel has helpfully provided all the tools to play mixologist, making it easy for everyone, from beginners to aficionados, to perfect their skills and concoct a tasty tipple. An in-room recipe card guides the way, with ingredients from the minibar already on hand. Extra equipment, like shakers or muddlers, as well as fresh fruit or other desired elements, can conveniently be ordered from room service. Options include the John Collins, the Screwdriver, and the Whiskey Sour, the three most popular drinks at the hotel's Sky Bar, which provides stunning views of Izmir Bay. This year, Fairmont Zimbali Resort is launching a new twist on a traditional favorite. The Breakfast Bunny is a fresh take on the Bunny Chow, which consists of a hollowed out half loaf or roll of bread, which is then typically filled with curry. Eaten without utensils, it is usually served as a lunch or dinner. By adding breakfast ingredients, the dish has a new wider appeal and makes an appetizing alternative to the standard bacon, eggs and toast classic. Busy guests will appreciate its grab and go appeal, but those who'd prefer to take it slow and simply savor a delicious traditional dish will also not be disappointed. At Barbados' Fairmont Royal Pavilion, executive chef Kirk Kirton is reviving decades-old Caribbean recipes with a modern touch, incorporating ingredients harvested in the hotel´s gardens. The breadfruit, one of the highest-yield food plants in the world and a staple food in many tropical regions, has a potato-like consistency similar to freshly baked bread. Chef Kirton expertly uses it to create items like Blackened Caribbean Shrimp on Pickled Breadfruit, refining a classic Caribbean staple in a new, original style. FRHI Hotels & Resorts (FRHI) is a leading luxury hotel management company that operates more than 130 hotels and branded residential offerings globally under the Raffles, Fairmont and Swissôtel brands. The company's distinctive portfolio of luxury and upper upscale hotels features celebrated icons, world-class resorts and stylish city center hotels. Some notable hotels include Fairmont Dubai, Raffles Singapore, Swissôtel The Bosphorus, Fairmont San Francisco and London's The Savoy. Focused on growing its distinctive hotel brands, the company is also developing new hotels in key locations around the world including exciting projects in China, Russia, Egypt, Turkey, Saudi Arabia and the United States. The company also manages Raffles, Fairmont and Swissôtel branded luxury private residence clubs, whole-ownership residences and serviced residences properties. For more information visit frhi.com. 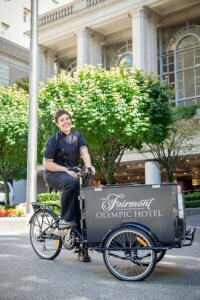 Fairmont's new Icicle Tricycle is among the many cool culinary treats and cocktail delights on offer at the luxury brand's hotels this summer.